Blue Grass Metals, Inc. is an industry-leading contract manufacturing, metal forming and assembly company that builds metal components and complex assemblies to our customers specifications throughout North America. We are ISO certified providing fabricated components to OEM clients in the automotive, , medical, energy, appliance, and agricultural sectors. Whether your project is wire/rod forming, stamping, cold upsetting, tube fabrication, components & inserts or value-added assemblies, we have the knowledge and drive to support your outsourcing requirements as seasoned contract manufacturing professionals.We can function as members of your team by providing assistance in solving manufacturability issues as well as value engineering where we can provide opportunities and ideas that will result in cost savings without losing functionality or part intent. Whether you need straightforward components or more complex assemblies … our staff can help you with your contract manufacturing needs! Blue Grass Metals utilizes a visual factory management system designed to operate a lean manufacturing environment through the utilization of “Just-In-Time” production techniques. This system ensures that stock levels are efficiently managed for our customers. We provide a rapid response to fluctuating inventory demands. The Blue Grass Metals ‘Just-In- Time’ delivery program allows customers to stop worrying about having the components they need for their operations. 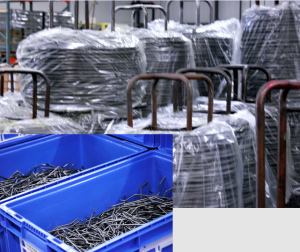 We are committed to having designated material in stock, and available for immediate delivery.